* Each tag shaped stencil measures 4.125" x 8.5". There is a hole at the top of each stencil, so you can attach them together using a Book Binding Ring, making organization and storage a snap! * Stencils are made from a semi-translucent heavy plastic, as shown in the second photo. Book Binding Rings sold separately. * Use layering stencils with your favorite inks, paints, pastes, sprays, stamps, and more for endless possibilities! 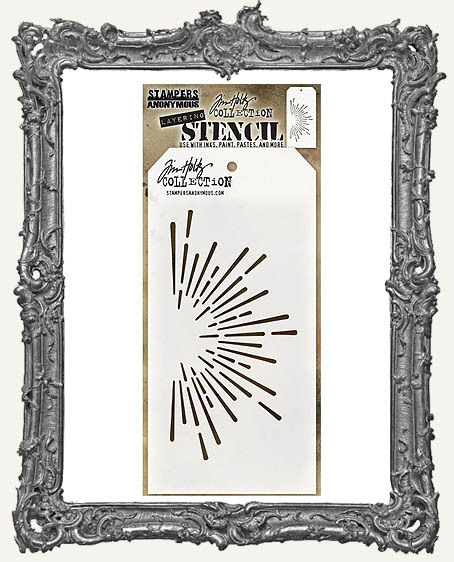 * See all of the Tim Holtz Stencils HERE.